Thank you for following us over the past year and for your continued support of the violin community, here online and in person at live performances in your community. Joshua Bell performed works by Mendelssohn and Beethoven with The Academy of St Martin in the Fields. Times of Oman: "The connection and chemistry between Bell and the elegant, refined orchestra was clear, as they play so beautifully together." Also, Josh's YoungArts MasterClass debuts tonight on HBO. Here's Laurie's recent post about the event. Sarah Chang performed the Barber with the Detroit Symphony Orchestra. Detroit Free Press: "Introverted and unsmiling, her interpretation ran contrary to the lush songfulness of the two opening movements. Even the athletic finale, with all of its dazzling passage work, came across as joyless. Chang must believe the piece a more deeply serious work than it is commonly thought to be, and I admire her willingness to stick to her vision, but it left me cold." Detroit News: "Listening to the concerto is like going for a leisurely Sunday drive, but when the jolting third movement arrives, we’re suddenly on the autobahn at breakneck speed. The relentless perpetual motion of zipping triplets can unravel even the most technically assured violinist, but Chang kept her cool, taking off like a colt out of the gate and crossing the finish line with aplomb." Lisa Batiashvili performed the Brahms with the New York Philharmonic. The New York Times: "Every violinist has things to say about this overfamiliar piece, and Ms. Batiashvili played it bracingly, without any sense of routine. She pushed the tonal envelope but never to breaking point, and sang with ravishingly long lines in the slow movement." New York Classical Review: "Batiashvili’s playing was rugged, playful, blood-stirring all at once. She played firmly in the string for almost the entire (last) movement, relenting only for the brief, singing quasi-cadenza right before the coda. This was a brilliant start to her yearlong residency with the Philharmonic." Augustin Hadelich performed Mozart’s Fourth Violin Concerto with the BBC Symphony Orchestra. The Telegraph: "...he was a heart-warming reincarnation of those naturally graceful violinists of the past like Schneiderhan or Grumiaux. High-spirits went hand-in-hand with perfect finesse." The Guardian: "...it was good to hear Augustin Hadelich, who was a fluent, vibrant-toned soloist in the Concerto and a laid-back virtuoso in his encore, Paganini’s Caprice No 9." Simone Lamsma performed the Korngold with the Oregon Symphony. The Oregonian: "Her playing was lean and tightly wound, with a silvery tone and tense vibrato, and she captured the music's intense lyricism and met its considerable technical demands with the kind of energy that kept you on the edge of your seat even as you wanted to melt off it during the slow movement." James Ehnes performed Prokofiev's Second Violin Concerto with the Sydney Symphony Orchestra. The Sydney Morning Herald: "His playing has transparency and strength yet betrays no hint of undue forcefulness or harshness. The brooding opening of the first movement was purely shaped and musically cogent, while the second movement found a serenity rare in 20th-century works." Rachel Barton Pine performed Vieuxtemps' Fifth Violin Concerto with the Wisconsin Chamber Orchestra. Isthmus: "The work's virtuosic demands were brought off fabulously by Barton Pine, balanced by sweet lyricism that demonstrated her genuine musicality and comprehensive understanding." Hyeyoon Park performed the Bruch with Hong Kong Sinfonietta. Time Out Hong Kong: "Park not only hit, but luxuriated in, each note, visibly engaged in passionate musical expression. She took the concerto at a slightly slower tempo than it is commonly played, and the audience was grateful for the chance to share how strongly she felt the music." Paul Huang performed the Walton with the Alabama Symphony. The Birmingham News: "Paul Huang, filling in for the originally scheduled soloist Elissa Lee Koljonen, displayed a brilliance that few 23-year-olds can. Commissioned by Jascha Heifetz and premiered in 1939, the concerto is one of most demanding of the 20th century, both for soloist and the orchestra. Huang captured its furiosity while delivering penetrating volume and sparkling technique that would be the envy of violinists twice his age." Michael Ludwig performed the Barber with Festival Miami. South Florida Classical Review: "Michael Ludwig, former concertmaster of the Buffalo Philharmonic, displayed an idiomatic sensibility for Barber’s brand of American lyricism." Victoria Mullova performed Shostakovich’s First Violin Concerto with the Hallé Orchestra. The Telegraph: "In a way it’s disappointing that Mullova’s playing hasn’t deepened emotionally over the years. Still, her clean attack, even under the greatest virtuoso pressure, was borderline phenomenal, and her indomitable sound in the final Burlesque won’t be forgotten in a hurry." The Arts Desk: "She gave an exhilarating account of the work, full of passion, precision and power. She showed real understanding of the dramatic shaping the concerto demands, from the deceptively restrained opening Nocturne, played with great delicacy, to the dazzling exuberance of the solo cadenza of the third movement. And in the closing Burlesque we found her skipping along with technical bravura." Kyra Humphreys performed the Bach's Violin Concerto No. 1 with the Royal Northern Sinfonia. 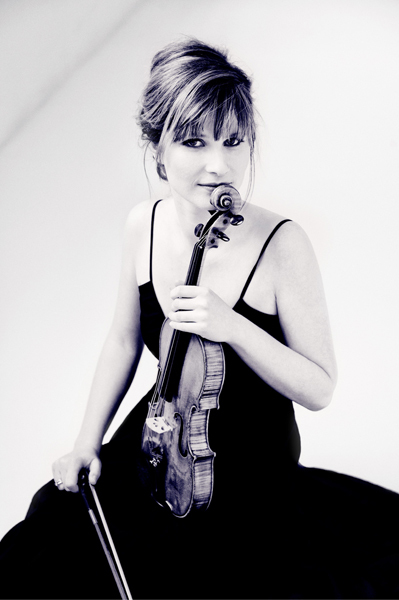 The Northern Echo: "Kyra Humphreys...gave a towering rendition of Bach’s Violin Concerto No 1 in A minor, eloquently building up the rich material of the opening movement." I thought the reviews overall were strongly favorable. Only Chang and Mullova had significant negatives. Sure, all these are great violinists, but if critics are going to be valuable at all, they should help us discriminate among the performances of even the very best, shouldn't they?